Cottage cheese is a fresh cheese curd product with a mild flavor. Curd size is the size of the chunks in the cottage cheese. 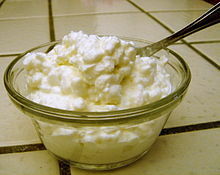 The two major types of cottage cheese are small-curd, high-acid cheese made without rennet, and large-curd, low-acid cheese made with rennet. Cottage cheese can be eaten in a variety of different ways: by itself, with fruit and sugar, with salt and pepper, with fruit puree, on toast, with tomatoes, with granola and cinnamon, in salads, as a chip dip, as a replacement for mayonnaise in tuna salad or used as an ingredient in recipes such as jello salad and many desserts. The first known use of the term "cottage cheese" dates back to 1831. ↑ "Definition of cottage". Online Etymology Dictionary. Retrieved 2008-10-11. This page was last changed on 11 December 2017, at 01:15.